This is not a mystery but it is a crime story. 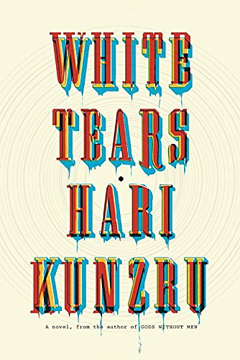 In fact, “White Tears” defies categorization. It’s well-written, provocative, antithetical, with multiple meanings. 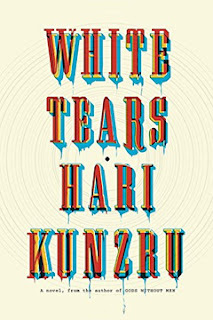 Hari Kunzru, British-born but now a New York resident, has traveled up and down the U.S. in search of this novel. It appears that his love of blues music, old blues, led to this fabulation of blues, cultural appropriation, and a contemplation of identity. Seth, the identity-torn, lost-in-time main character, is a young white man. He is poor and without visible family connections. Reviewers, and perhaps even Kunzru, have defined him as a “hipster.” There’s nothing, except a hat, that has necessarily marked him as one. Seth’s aesthetic is perhaps of the “non-“ variety: non-specific, non-chic, non-aggrandizing, non-accreting. His one friend, and who can say why he has acquired that specific friend, is Carter, the scion of a rich, powerful family. Seth’s true talent and compulsion is auditory. (Look for the point in the story in which he loses the hearing in one ear. Does it make him more of a normal person?) He is a techno-geek and builds auditory spyware out of junk. Through Carter he vastly improves his collection. Seth seeks the nature of humanity in its sound. Will he then be able to define his own humanity? Kunzru does in the end define Seth, but by that point Seth stands for much more than just himself. One day Seth seems to record a man singing a blues song: “Believe I buy me a graveyard of my own … Put me under a man they call Captain Jack.” There is something captivating and pure about the song. Carter, already obsessed by different styles of music in turn, becomes obsessed with it. Seth and Carter manufacture a record and add details to make it sound like an old 78. It causes a minor stir in the slice of the music world devoted to old-time blues. Seth and Carter named the singer Charlie Shaw. Then a mysterious collector claims there is actually an old record of that song by a singer named Charlie Shaw. It is the holy grail of collectors. But we made it up, declare Seth and Carter. Ghosts, demons and death follow. Kunzru twists reality and offers several storylines, which are not obvious at first, obscured as they are by similar narrative tones and a similar objective. Throughout the book, Kunzru draws his readers down to a distillation of what it means to sing the blues, what experiences authenticate the blues, what appropriation by people who do not understand the genesis takes away from it. It is more than racism or white privilege or benign misappropriation; it is the experience of a people because they are black. Not because they are good or bad or weak or strong or any of the other race-neutral attributes by which we judge and classify people, but because they are black. Kunzru takes us slowly through to the end with this thought in mind. In the end, Elvis singing old-time blues songs is just Elvis mouthing words. This is the second of the Indian books I stumbled across recently. (Mustn’t fight karma!) And it IS a mystery. Vaseem Khan is a London author who turned his decade-long work experience in Mumbai into the Baby Ganesh Detective Agency series. 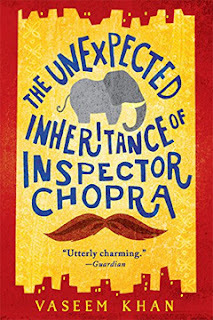 “The Unexpected Inheritance of Inspector Chopra” is the first. Khan has written two more so far. The “unexpected inheritance” is Ganesh, a baby elephant. It was given to Inspector Chopra by his favorite uncle under somewhat mysterious circumstances. It comes at a time when the inspector must step down from his job as a police inspector because of health reasons. All Ashwin Chopra has known for thirty years is how to be a detective, an honest detective. He is respected by his underlings and mostly left alone by his superiors. He has even won an award for taking down one of the biggest criminal bosses, Kala Nayak, who died in a fire in his building as the police were closing in. Chopra’s wife, Poppy, is happy with her husband’s retirement. She fusses over him and feeds him too much. She is proud of him but happy he is now out of harm’s way. They have never had children, much to their sorrow. Just as Chopra is about to end his last day on the force, a case comes in. A young man has drowned in fetid water. It looks as though he was drunk and unable to pull himself out of the water. Chopra wants an autopsy, but that is countermanded by his superiors. The young man’s mother wails at the station about how her son’s death must be investigated. Intuition damns Chopra, as he agrees with her that something is fishy about Santosh Achrekar’s death. Despite his lack of credentials Inspector Chopra (Retd) pokes his nose into the case, since the powers-that-be in the police department seem determined to bury (or cremate) the case as soon as possible, if not sooner. Juggling Santosh’s supposed murder with what to do with the elephant bequeathed him by his uncle keeps Chopra busy, busy, busy. Ganesh, for that is what Chopra and Poppy call him, is a baby, but he is an elephant baby. When Ganesh almost drowns in the first monsoon rain, he takes up residence in their living room. (Fortunately for the purposes of this story, the elevators in their building are extra wide!) Obviously, Chopra cannot keep an elephant in the courtyard of his apartment building or in his living room. Or can he? It may be a moot point, since the elephant appears to be ailing. He is listless and thin. His uncle said in his brief note to Chopra that the elephant is “special.” So far nothing special has become apparent, and Chopra is running out of vets and specialists to read or contact. As Chopra delves more into Santosh’s case, he realizes that the case is quite complex and may work down to dark elements in the criminal world and corrupt elements in the political and police worlds. This was exactly what his doctor wanted him to avoid: excitement! Khan presents a picture of Mumbai that is mostly sanitized, but there is enough realistic detail so readers won't mistake Mumbai for Surrey, England. Most of the story is G-rated, but there are eventually elements that present a darker picture of some criminal enterprises. Nevertheless, this is a delightful first journey with Inspector Chopra as he tries to figure out his new place in the world. And Ganesh is a worthy sidekick! This is not a mystery, except maybe as an example of the mystery of love and optimism. Initially, “The Amazing Story, etc.” reads like a work of fiction. In fact, the bones of the story are true, and the underlying dialogue and feelings have been supplied to the best of PK & Charlotte Mahanandia’s memories, and converted into moving text by Per J. Andersson. PK Mahanandia is a member of the untouchable class. As a child, he was humiliated, bullied, and ostracized, just because he was born into a certain caste. As PK himself laboriously (off screen) sometimes pointed out to non-Indians, there are four main castes, but there are thousands — thousands! — of subdivisions of those castes. A few of those subdivisions are untouchables. Their people work with leather, handle the dead, dispose of waste products, and other tasks “beneath” the purview of the rest of the Hindus in India. Yes, “The Amazing Story” is about romantic love but it is also about the complicated community of diverse ethnicities, religions, and communal identities in India. It is briefly about the politicization of discrimination by Indira Gandhi, who tried to legislate away discrimination against the untouchables, as did one of her predecessors, Mohandas Gandhi (no relation). I kept waiting (not impatiently) for the cycling part of the story to begin. It doesn’t happen until about two-thirds of the way in. That’s because there is so much to say about PK’s life until he meets Charlotte. PK’s journey is bad luck, worse luck, then good luck, talent, and ultimately an ineffable optimism, despite three suicide attempts. In the same breath, metaphorically speaking, I’m going to say that the suicides are not representative of PK’s attitude, nor do they represent the tenor of the book. (Plus, they were obviously unsuccessful.) But what good story doesn’t have its travails? I guess I’ve gone on about this book because it is a sweet story, smoothly translated. PK learned to speak English in India, so I've watched an interview of him in English. He worked hard to learn Swedish. He has been living with Charlotte in Sweden for over forty years. They have two grown children. If this story had been told back in the 70s or 80s, it wouldn’t have had the same impact. Knowing that Charlotte and PK, the untouchable, have been successful in Sweden and in fact have provided education and infrastructure support to PK’s little village in India makes the story that much sweeter. It gives me hope that people can overcome extreme prejudice against them. PK used his talent and obvious capacity for learning to keep moving forward in life. That’s worth a book or two, surely. 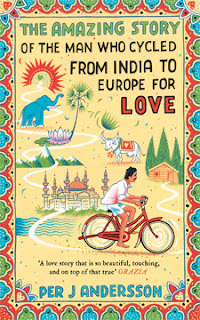 By chance, I am reading four books about adventures that take place in India. Two of them are not mysteries. The review for one of them follows this post. One of the mysteries was written in the 1950s. It describes a fairytale place that the other contemporary books can only imagine. The 1950s book stars a white woman. Two of the other books are written by Indians with Indian protagonists. The last book, the one whose review immediately follows, was written by a Swedish journalist about an Indian who fell in love with a Swedish woman. It is the only non-fiction book of the bunch. So, slowly over the next couple of weeks, I hope you will join me in reading four very different views of a very large country, with a very large population, and with a very significant history. How old was Flavia de Luce in “The Sweetness at the Bottom of the Pie,” the first book in the wonderful series begun in 2009 by Alan Bradley? Eleven? Now she’s twelve. 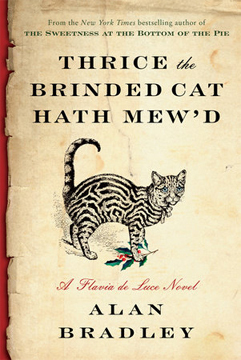 That’s a lot of living for Flavia in the course of one or two years, because “Thrice the Brinded Cat Hath Mew’d” is the eighth book. The title comes from the incantation uttered by Shakespeare’s wicked witches in Macbeth, more famous for the line, “Double, double toil and trouble.” There is indeed a cat in the book whose part is merely a walk-on but essential. There is a purported witch in the book. And that is where the similarity to Macbeth ends. Flavia de Luce has a penchant, remarkable for a twelve-year-old, for discovering corpses. She has a scientific, investigative mind, so the times when she stumbles across a dead body are occasions for celebration. Discreetly, of course. It is not that Flavia is without compassion, but her eccentrically framed mind needs a challenge to keep ticking. And to keep her mind off her family’s troubles. It is the 1950s. The setting is the Buckshaw estate, near Bishop’s Lacey, England. Flavia has returned from the wilds of Canada, having been tossed from the boarding school to which she was packed off. Her return has provoked no welcoming arms or cheery hallos. Instead, she returns to snippy, silent older sisters, a bothersome younger cousin now in residence, and a father hospitalized with pneumonia. Only Dogger, the estate’s manager/general dogsbody and resident mysterious personage, has some kind words and time for Flavia, but even he is stressed and gloomier than usual. Luckily, a corpse appears. In the course of running an errand to the home of Roger Sambridge, an arthritic woodcarver, Flavia discovers the poor man hung upside-down on his bedroom door. Dead as a doornail. Instead of screaming or running to find the nearest phone to call the police, Flavia examines the room for clues of the man’s death. Was he the sacrifice in a strange witchy ritual? As she finally exits the house to find a phone, she notices the curtains twitch in the house across the street. That will bear investigation later. While perusing Sambridge’s effects, Flavia comes across books by children’s author Oliver Inchbald. What is an old man doing with these children’s books? Did Sambridge have something to do with Inchbald’s death several years ago? As Flavia digs further into the two mysterious deaths, she calls on old friends to help her, Mrs. Bannerman. She was one of Flavia’s teachers in Canada She turned out to be a murderer and a member of the secret society of Nide, the organization Flavia’s mother was assisting when she died. (I know, that seems terribly complicated, doesn’t it?) Also, the strong and warming presence of Cynthia Richardson, the vicar’s wife, and the steadfast, intelligent one of Inspector Hewitt do not let her down. Flavia is twelve and she essentially sees the world through a twelve-year-old’s eyes. She has determination and heart, but also a need to mean something to somebody. With a father broken by the horrors of an internment camp in World War II, the death of his wife, and the mounting bills for running Buckshaw, Flavia must mostly determine her own course. This is a lovely series. Flavia is prickly, lonely, stubborn, inventive, surprising, and vulnerable. She is an unusual heroine for adult readers to embrace, but it turns out that we are here for her in droves.